Fig. 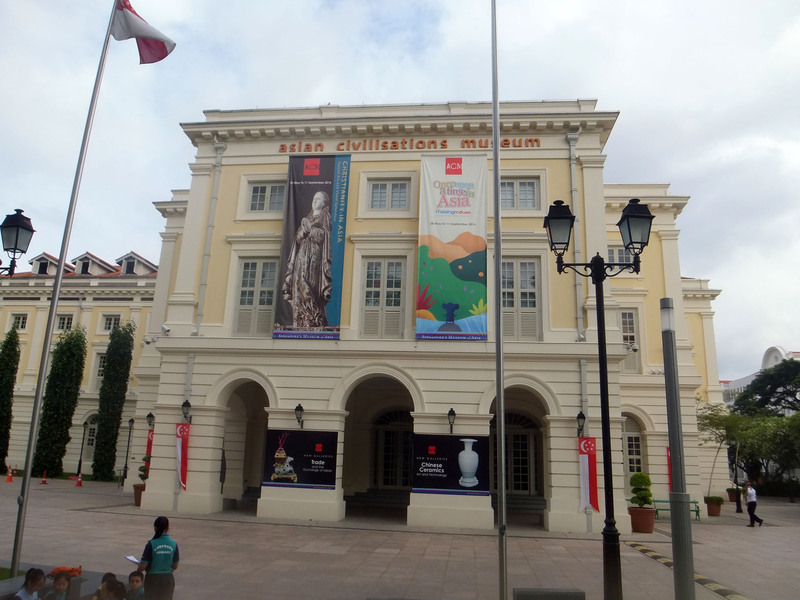 1, Asian Civilisations Museum, Singapore, 2016. Located in the historic Empress Place building, ACM is a neoclassical-style building which was used for over 100 years to house colonial and, later, Singapore government offices along the Singapore River. Fig. 2, Posters of Virgin and Child were displayed behind the information desk. 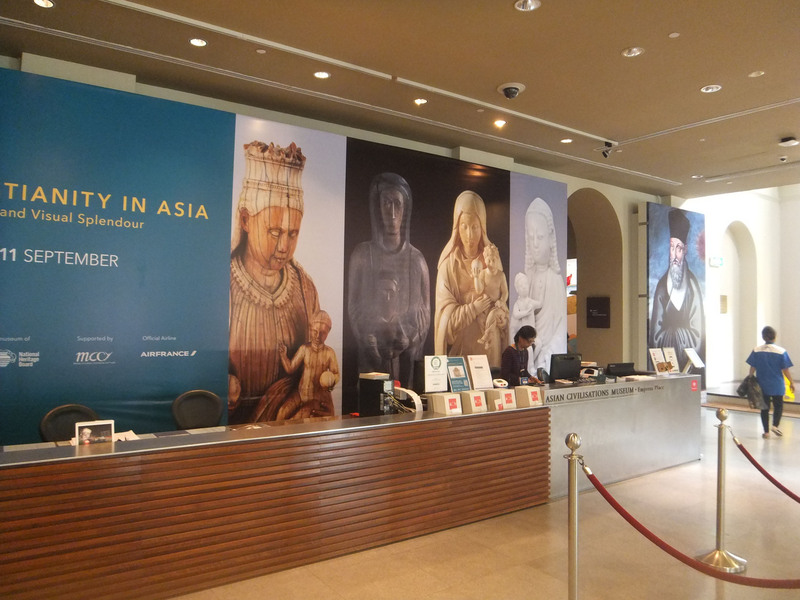 The exhibition “Christianity in Asia: Sacred Art and Visual Splendour,” which opened at Asian Civilisations Museum (ACM) in Singapore in summer 2016 (Fig. 1, 2), was the world’s first exhibition on the worldwide spread of Asian Christian art. The collections were chiefly devoted to Asian objects created in the pre-modern period. 153 pieces of hybrid works explored European Christian themes but were made from precious materials found in Asia, using a variety of techniques that were unknown in the West. For example, Christ as the shepherd boy was one of the most common themes in Christian ivory in Southeast Asia (Fig. 3). Depicted as a meditative figure, the Christ child sits on the rocky mound with a tree behind him. 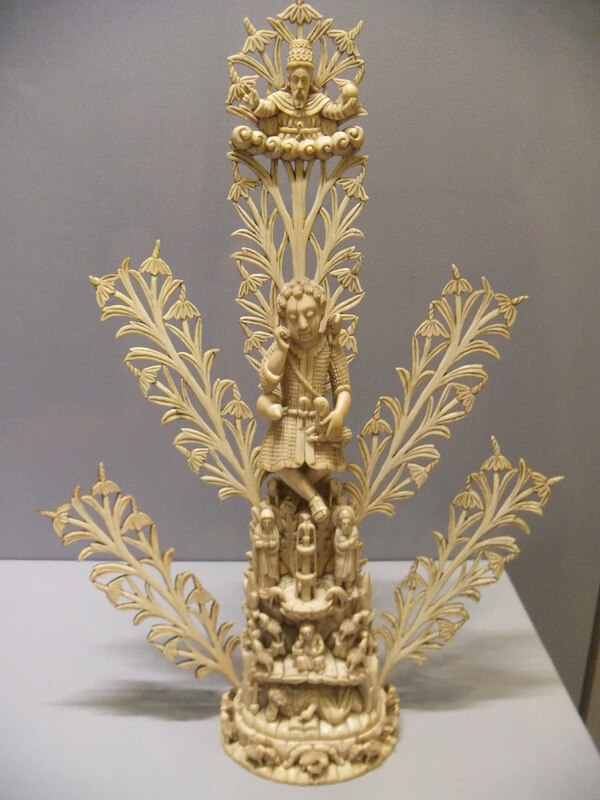 This ivory sculpture was characterized as being hybrid by integrating Indian elements in the forms of native flora, fauna, mountain, and fountain that are easily found in the iconography of Asian religions. Beginning with the display of the bronze crosses of the churches of the East, the introduction of early Christianity in central Asia and China with chronological arrangements makes sense, giving a background of cultural appropriation shown in these monuments of objects. Instead of mistakenly viewing Asian Christian art as simply copying of European models, these tiny crosses with different designs are the visual statements that Christianity exists in Asia earlier than we imagine. The collections including Catholic art and the artistic productions of Protestants in the Dutch Indies were displayed in a geographical order from India, China, Japan, to Southeast Asia, succinctly revealing the history of Asian Christianity through the thematic orders. The way one group of works led into another possessed a clarity, such as Saint Francis Xavier’s journey to the Far East, the Mughal court’s fascination with Christianity, Italian Jesuit Matteo Ricci in China, and the painting academy in Japan. The exhibit ended with recent objects from the region of Singapore, which echoed the local Christian mission art and history. The entire collections embody the scope of Christian mission and interreligious dialogue manifested in these liturgical/devotional objects. The show proves to us that the hybrid characters of Asian Christian art are intertwined with different Asian religious motifs, such as Buddhism, Islam, and Confucianism. Indeed, the exhibition leads us to see the ancient roots of Christianity in Asia and how the different faith traditions coexist in one specific object symbolically. We imagine how the arrival of European traders and missionaries brought a new wave of Christianity and objects of variations to Asia that bound several regions together in networks of artistic and knowledge exchange. Fig. 4, The Installation: Write a Message In the sky. 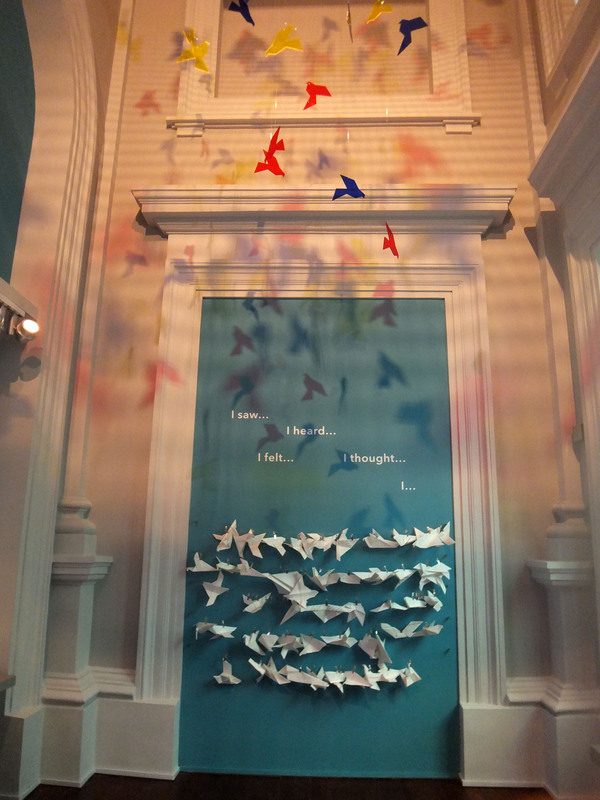 Viewers were encouraged to make paper doves and write down what they see and hear from the soundscape, recorded in the early mission church. The use of multimedia helped the viewers to engage with the material culture of early Asian Christianity. Besides, viewers engaged the lived Christianity in Asia as well as missionaries’ stories behind these objects that made the exhibit becomes worth seeing (Fig. 4). For example, several free, in-depth lectures related to the exhibit theme, the musical shows and historical dramas on early Christianity, the arrangement of the monumental walking tours to the local churches in mission history, and the exhibit guided tours led well by the experienced docents – these events all made the exhibit a real feast of visual splendor. The weakness of the exhibit, perhaps, was on the still conservative way of installation. The jewel-case setting with spot lighting and contextual materials such as long labels all worked very well in unity, it could have been more creative in treating the objects not as merely static artifacts but the product of an ongoing process of cultural exchange. Overall, we see objects themselves with exotic materials, beautiful forms, and excellence of craftsmanship, but more than these are cultural mediation between Christianity and different Asian faith traditions. These objects made by unknown Asian artisans not only inspire our multiple ways of seeing Asian art Christian, but also demonstrate the opportunities of using objects as visual evidence for the study of material culture of Christianity. We are glad to see ACM continues to devote itself to preserving the cultural heritage of Asia, helping us to see the cross-cultural dimensions of Asian Christian art.